The ceremony at Westminster Abbey begins at 11am. Kate will travel by car at 10.51am, starting at the Goring Hotel near Victoria Station, then travelling along the Mall, Horse Guards Parade, Whitehall and Parliament Square. At 12.15pm, the couple, along with members of the royal family will travel in a procession of horse-drawn carriages along the same route to a reception at Buckingham Palace. Big screens relaying the event will be set up in Hyde Park, Trafalgar Square and Walthamstow. At 1.25pm, the Queen and the bride and groom will appear on the balcony at Buckingham Palace, and at 1.30pm there will be a fly past by the Royal Air Force and a Battle of Britain memorial flight. A number of road closures will be in effect for parts of the day, including Grosvenor Place, Haymarket, Hyde Park Corner, Knightsbridge (east of Sloane St), Park Lane and Piccadilly. There will also be some wedding-related road closures on Apr 27 2.30-7am. As the royal wedding day is a bank holiday, it has been designated a congestion charge non-charging day. All tube lines will be running, with no planned engineering work. Here's a look at some of the main celebrations, parties and events going on in and around London on the special day. There could be anything from 200,000 to 500,000 people celebrating the Royal Wedding in Hyde Park on the 29th April. There is a giant observation wheel in place at the Bandstand in Seprentine Road which stands some 60 metres tall with tremendous views over the park and the city. There will also be several giant screens in place around the park that will display live screenings of the day's events. Food and drink will be available for purchase on the day but you will have to pay to enter the park, you can pay on the day but expect to pay between £5.00 and £7.50 per person. There is a useful royal wedding route planner. The capital is to party for a week in the run-up to the royal wedding. Boris Johnson will kick-start events with a £100,000 bash in Trafalgar Square to celebrate St George's Day. A South Bank spectacular marking the 60th anniversary of the Festival of Britain will see the Thames come alive with fairground rides, music and dancing. 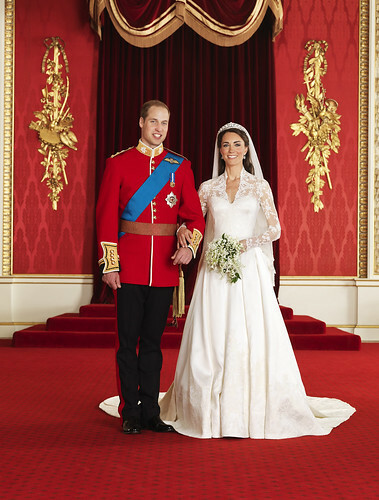 And some 200 street parties will be held to mark the April 29 marriage of Prince William and Kate Middleton. The Mayor has moved his annual St George's Day celebration to the Square to capitalise on worldwide fascination with the marriage. The free concert will be held on Saturday April 23, in the middle of the Easter weekend, and will feature a chart-topping band, stars from West End musicals and young musicians. The Mayor wants "to capture the celebratory mood during the week prior to the wedding" and showcase the city to the world's media. A spokesman for Mr Johnson said: "Everything we are doing is about what a fantastic place London is, telling the world we want to put on a good show, for people here and visitors to the capital as well." The concert is likely to attract about 15,000 people and will "celebrate English culture, including all the nations of Britain". Past events have featured music hall, folk music, and Charlie Chaplin and Monty Python films. There will be fairground rides, "pop-up" statues, beach huts along the Thames and outdoor dancing, eating and drinking. A survey by the Local Government Association found 70 road closure applications had been made across 13 of London's 33 local authorities for royal wedding day, suggesting up to 200 parties may be planned. Hillingdon is hosting 22, followed by Hammersmith and Fulham on 11. Many more are expected as many councils have said they will accept the paperwork for closures up to the end of March. Several have waived the normal fee for applications, including Harrow, Havering, Newham and Islington. Nicki Hookings, organising a party in Marylebone, said she expected about 400 guests: "We're looking at having a juggler and a band, plus bunting and British food. We're hoping to achieve a real sense of togetherness." In Southhall, MP Virendra Sharma is helping to organise a do in Clarence Street, where Kate Middleton's parents once lived. World food, dance and music, with coverage of the royal wedding on the big screen. Entertainment includes fire eaters, stilt walkers, donkey rides and clairvoyant readings. Proceeds go to local charities Wandsworth Oasis and the Katherine Low Settlement.